StFX student Amelia MacKenzie (left) is presented with the Holly E. Bartlett Memorial Bursary from Holly's mother Marion Bartlett (centre) and sister Amanda Jenkins. The memory of StFX graduate Holly Bartlett was once again celebrated as family, friends and members of the StFX community gathered April 5 for the 2018 presentation of the Holly E. Bartlett Memorial Bursary. StFX nursing student Amelia MacKenzie of Sherbrooke, NS is this year’s recipient of the annual $500 bursary. The Holly E. Bartlett Memorial Bursary is available to a full-time undergraduate female student from Atlantic Canada who has a minimum average of 75. The student must also demonstrate financial need and a commitment to community service and student activities. 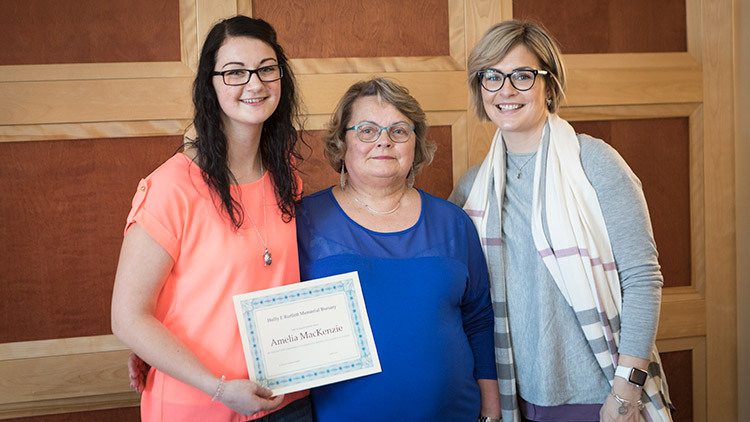 Holly’s mother Marion Bartlett and sister Amanda Jenkins presented the award to Ms. MacKenzie in a ceremony held at the Reading Room in the Physical Sciences Building. Ms. MacKenzie graduated from StFX with a BSc degree in 2017 and is now completing the two year BSc nursing - accelerated option degree. Along with maintaining an average of 75 or over, she is actively involved. She tutors with the Antigonish County Adult Learning Association, volunteers at the campus blood drive and has recently joined the StFX Nursing Society. The annual bursary was started by the Bartlett family and friends to honour Holly, described as a fearless, competent woman with a great sense of humour. Ms. Bartlett was born in Halifax, NS, with an eye condition called Microphtalmia characterized by small underdeveloped eyes. By the time she was 13 she rapidly lost what little sight she had. She graduated from Prince Andrew High in June 1997 with several awards and scholarships including The Walter & Wayne Gretzky Scholarship. She and her guide dog Willow started classes at StFX that fall. In 2002, she graduated from StFX with an honours arts degree in psychology, earning a spot on the dean’s list. She also attended Carleton University, received her human resources certificate from the Nova Scotia Community College, and at the time of her death in 2010, was working for the Department of Community Services and enrolled at Dalhousie University where she was working toward her master’s in public administration. Her degree was awarded posthumously May 2011. Ms. Bartlett was remembered as an independent young woman, who never wanted her disability to define who she was. She was always looking for her next adventure and experienced sky diving, rock climbing and swing dancing.